Three Card Poker, also known as Trey Poker, Tri (3) Card Poker and Poker Three, was developed by Derek Webb in 1990s as an attempt to simplify and speed up the game while maintaining the same level of excitement. It plays with a 52-card deck and offers two wagering opportunities in one. 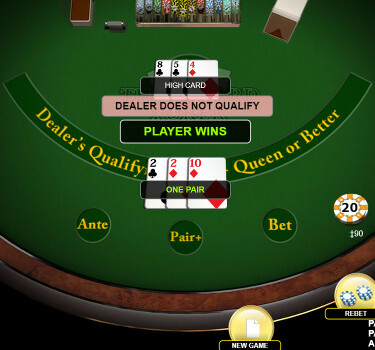 Players can bet against the dealer and /or place Pair Plus side bet which wins or loses independently of the dealer’s hand. Sometimes placing Ante bet is a prerequisite for being able to take advantage of the side bet, other times one can play either. As far as rankings go, High Card is the weakest hand followed by a Pair, Flush, Straight, Three-of-a-kind and Straight Flush. Do note that Three Card Poker ranks hands a bit differently to most other Poker games. Here Straight beats Flush, and Three-of-a-kind outscores both. If doing a search for 3 Card Poker, also look for Tri Card and Tres Card. Different Casinos call it different names. 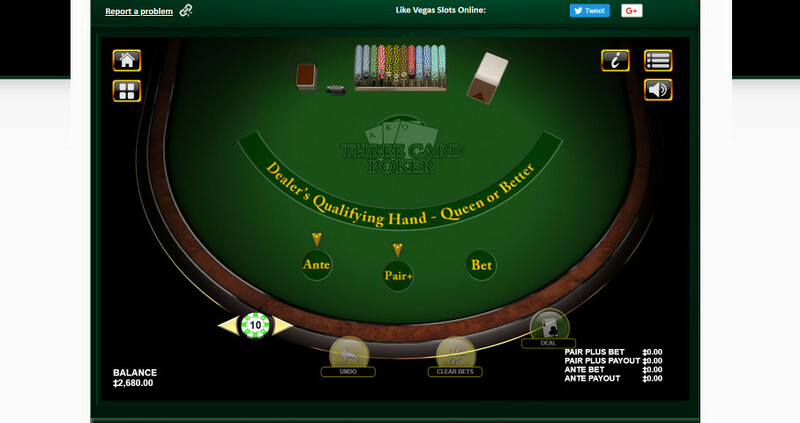 Along with more than a few game variants governed by a Random Number Generator, there’s also an opportunity to play against a live dealer rather than a computer. Evolution Gaming Live Three Card Poker features an additional hand which ranks higher than Straight Flush. It’s called Mini Royal and consists of an Ace, King and Queen. The same game also offers two optional bets instead of one, namely Pair Plus and 6 Card Bonus. The latter pays for a 5-card poker hand created by combining your cards with those of the dealer and wins with Three-of-a-kind, Straight, Flush, Full House, Four-of-a-kind, Straight Flush and Royal Flush. To start off, you’ll need to decide how much you want to wager and place your bet on Ante and / or Pair Plus position. Both you and the dealer will then receive 3 cards each, yours being dealt face up and theirs face down. Having seen your hand, you can decide to fold (and lose your wager) or play on by investing an additional amount equivalent to Ante bet. That’s when the dealer reveals their hand and potentially qualifies with a Queen high or better. Failing to qualify earns you even money on your Ante while Play bet pushes. Otherwise, your hand will have to outscore the dealer’s in order to collect 1:1 on your Ante and Play bets. 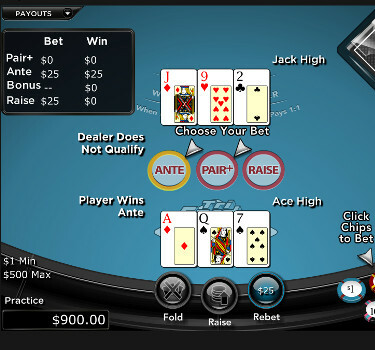 A tie may be handled in different ways, either resulting in a push or automatically ranking the player’s hand above the dealer’s. In addition, regardless of the value of your opponent’s hand, Ante Bonus makes your Straight deliver 1:1, Three-of-a-kind 4:1, and Straight Flush 5:1. Pair Plus bet pays for a Pair or better even if the dealer beats you in the Ante game. You’ll normally receive even money for a Pair, 4:1 for a Flush, 6:1 for a Straight, 30:1 for Three-of-a-kind, and 40:1 for Straight Flush, though this may slightly vary from one online casino to another. In Evolution’s live version, having placed Pair Plus bet and getting lucky with a Mini Royal wins you 100:1. The 6 Card Bonus delivers a minimum of 7:1 for Three-of-a-kind and as much as 1,000:1 for Royal Flush. Three Card Poker is an exceptionally simple game variant which doesn’t take long to master. As with any other poker game, the most important decision is whether to play or fold, and in this particular case, the optimal strategy is dead simple. At the same time, there’s no strategy one can employ where Pair Plus bets are concerned, though we can offer one recommendation to increase your chances of winning. As far as Ante bet is concerned, you should play if your hand consists of Queen, 6 and 4 or higher, and fold if it’s lower. The way to evaluate it is to compare the highest card first, then the second highest, and finally the lowest. For example, K-3-2 is higher than the above mentioned minimum, and same goes for Q-6-5. Using the same logic, Q-7-3 is also considered to be higher as the highest card is the same as in “should-play” scenario and the second one is higher, so your third card makes no difference. Ready to play some Three Card Poker or any other variant? The people over at CasinoMAX have you covered along with a pretty sweet Bonus of up to $9000 on your first 3 deposits!. For reviews on other Casinos we’ve already checked out for you, head on over here. Some casinos allow ties to be paid to the player, in which case you should also play with Q-6-3 but only when these three cards are of different suits. The logic behind this recommendation is that this kind of combo decreases the dealer’s chances of revealing a Flush. A fun, easy game where your pair of 2’s can easily be the big winner! While there’s no particular strategy when it comes to Pair Plus bets, we should warn you that about 74% of all hands will result in a combo which is weaker than a Pair, meaning you’ll lose your Pair Plus wager. One can still occasionally use this option but remain aware of low win probability. Still on the subject of Pair Plus bets, you’ll see that some casinos pay 6:1 for a Straight, in which case house edge is a still acceptable 3.37%, while others pay only 5:1 and thus increase the edge to high 5.57%. There’s nothing you can do where payouts are concerned but you’re obviously free to look for gaming sites playing more in your favor. To give you a hint on whether it pays to place 6 Card Bonus bet in Live Three Card Poker, we’ll share the following information: the optimal RTP on Ante bet is 96.63%, RTP on Pair Plus bet is 95.51%, and it drops down to 91.44% with 6 Card Bonus bet. To put it simply, this optional bet is far less likely to deliver and should therefore not be part of your regular playing pattern. On the other hand, potential payouts of 100:1 for Four-of-a-kind, 200:1 for Straight Flush and 1,000:1 for Royal Flush might justify taking a risk once-in-a-while. To summarize, Three Card Poker is one of the easiest games to learn with a lot of fun to be had once you develop your own strategy. If you’re just learning how to play, a lot of Online Casinos will let you play for free with “Fun Money”. Use this to skill up and win big! Is It Possible to Beat Roulette?